As the universe of illiquid assets grows so grows the need for VRC’s Portfolio Valuation Group. Portfolios themselves have grown more complex, incorporating alternative asset investments among the traditional stocks, bonds and cash equivalents. Due to increased investor, audit and regulatory scrutiny around fair value reporting for illiquid, non-public investments, private equity funds, private debt funds, hedge funds, financial institutions and investors rely on VRC for independent third-party valuation services. When an investment portfolio includes illiquid, non-public assets, a specialist is often needed to analyze and report the valuation of these investments for financial, investor or lender reporting. Engaging a third party to perform portfolio level valuations, the valuation process bolsters documentation, increases independence and transparency and materially reduces measurement and reporting risks. VRC's portfolio valuation practice group conducts valuations of debt and equity investments of over 50 fund portfolios, including over 25 business development companies. Not only does this provide VRC the experience and ability to execute accurately, but we also have a large database of propriety market data, which we use to enhance our precision. We provide fund managers and clients extensive experience across a myriad of industries. As a third party assessor, we are able to add an independent viewpoint as well as an extra layer of support and transparency with more robust valuation policies that conform to best practices. We deliver well-supported conclusions and reports that comply with the relevant reporting standards and substantiation to withstand possible scrutiny. Business development companies present distinct valuation challenges. As SEC-registered 40 Act Funds with quarterly reporting requirements and portfolios that can include illiquid private securities, most BDCs engage outside valuation consultants to help meet the challenge. Today, however, regulators also expect managers to demonstrate a firm grasp of the inputs and judgments used to determine fair value. We recognize this imperative and have been selected by over 25 of the leading BDCs to provide valuation opinions that are transparent, verifiable and audit-friendly. Accounting Standards Codification 820 (ASC 820) has established requirements for providing investors with more transparency. Many hedge fund managers rely on third-party experts to value complex portfolio positions. We work with dozens of hedge fund clients in an array of flexible engagement structures, from providing comprehensive fair value opinions (on individual securities or entire portfolios) to reviewing a funds’ own internal valuation models and giving assurance on their reasonableness. Fair value is defined as the price that would be received for an asset in an orderly transaction between market participants. Yet in illiquid markets where most transactions are conducted privately, limiting publicly available data, determining fair value for private instruments can be challenging. This becomes a greater challenge when markets are disorderly, there are few participants or those who are participating may be transacting under distress. 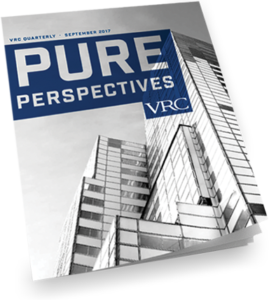 As a leading provider of illiquid asset valuations, VRC is uniquely positioned to provide the combination of rigorous fundamental analysis and technical, market-based perspective that regulators, auditors and investors demand. VRC is a leader in delivering portfolio valuation services due to our extensive experience in illiquid transactions, propriety data that we have compiled across all industries, and our well-credentialed, dedicated and focused portfolio valuation team. Assessing Level 3 securities—whose value is largely driven by unobservable inputs—requires access to the best information and the experience to know what information applies at a particular stage in the issuer’s lifecycle. With debt, for example, is comparable yield analysis appropriate or is it time to focus on recovery value? For equity, how do the company’s financing history and features of the security impact value? VRC has helped investors make judgments like these for more than 40 years. In today’s private equity market, the capital may still be patient, but investors and regulators increasingly are not. Whether it’s limited partners and board members of a fund, stakeholders in a family office that makes direct private equity investments, or regulators in a post-Dodd-Frank framework, the expectation is for transparency and regular, fair value-based reporting. VRC works with market participants to implement sound valuation programs that satisfy regulators and give investors confidence. Venture-backed companies can present complex valuation issues such as warrants, stock options and Section 409A, tiers of preferred equity with different economic rights, non-linear payoff profiles and option-like features. Considering past financings and interests and potential future funding or stock offerings, it is often not sufficient to simply value the total enterprise and take a fully diluted percentage to value a share. At VRC, our experts employ quantitative tools in the context of a qualitative valuation of the entire interconnected capital structure to value venture companies.